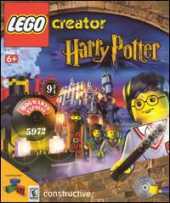 Recreate the magical world of J. K. Rowling's Harry Potter with an unlimited supply of virtual LEGO building blocks. With this set, players can design their own three-dimensional scenes at Platform Nine-and-Three-Quarters, inside the hallowed halls of Hogwarts, or on the enchanted school grounds. Once the scene is set, place LEGO versions of Harry, Hermione, Ron, Dumbledore, Hagrid, Snape, and other characters to watch them interact with their surroundings. Magical animals of Hogwarts are available too, including Hedwig, Fluffy, and even Norbert. Exercise creativity in free-form play, or take on one of the game's special challenges such as "Where's Scabbers?" or "Flying Practice." LEGO Creators who can beat a challenge are rewarded with a new spell. There's hundreds of virtual LEGO building bricks. Recreate Diagon Alley, Hogwarts Express, and Hagrid's Hut. Explore your own magical 3D world from first-person perspective. Test design and construction skills with in-game challenges.